We will be holding an open house on Tuesday, October 27th from 5:00-7:00pm to celebrate many things! We have expanded our studio/offices and hired several terrific employees. We are also celebrating our employee of 12 years, Sherry Sumner. 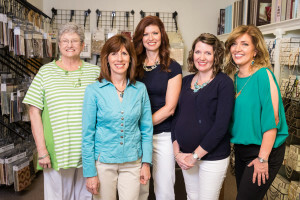 Sherry has been the rock for our clothing alterations company, Sew4U. She is retiring and Tuesday will be her last day with Sew4U. Help us celebrate this fabulous, talented woman! There will be door prizes, refreshments, and live music! Some of our door prizes include: Custom pillow by Window Works Studio, Hunter Douglas window treatment, Alteration from Sew4U, handmade body scrubs from Sugar My Body and more… Drawings at 6:30 pm…you must be present to win. Live music by Carol Rauch, Harpist. boxes using customer’s fabric designs and have several molds for drapery finials for custom finishes.